West Germany, 1977, 123 Minutes, Colour. Bruno Ganz, Dennis Hopper, Gerard Blain, Lisa Kreuzer, Nicholas Ray, Samuel Fuller, Jean Eustache. The American Friend is a German thriller based on the novel Ripley's Game by Patricia Highsmith. The film was written and directed by Wim Wenders, a notable German director of the 70s, famous for his experimental films and his homage to the American Road films ? Alice in the Cities, Wrong Movement, King of the Road. The film is much more in the commercial vein and is quite successful as a thriller and a psychological study. Dennis Hopper is at home in the enigmatic central role of Ripley. However, Bruno Ganz is superb as Zimmerman, the dying man who is persuaded to be an assassin. French actor Gerard Blain has a key role. Of interest is Wenders' use of notable directors in acting roles eg. Nicholas Ray as the American artist. Samuel Fuller as the American and Jean Eustache as the friendly man. The atmosphere of New York and Paris is effective but especially of Hamburg and its pervading atmosphere for the whole film. Wenders' homage to American influences eg. cowboy songs as well as the English Beatles songs sung and hummed by the two main protagonists, the themes of Hitchcock transference of guilt are quite in evidence. 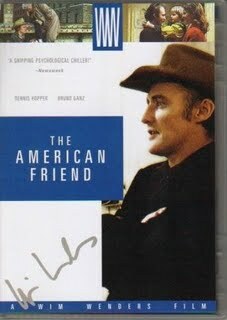 The American Friend is a serious drama and makes excellent, serious use of thriller conventions. 1. The quality of the film as a thriller, study of human nature, portrait of a man trying to cope with the meaning of existence and life? Combination of all these? 2. A German production: the quality of techniques, location photography, colour, the creation and atmosphere of German cities, New York and Paris, homes, shops, the world of the wealthy, the world of the poor, the world of gangsters, travel and trains? The overall atmosphere of Hamburg? The score, the use of contemporary songs, a film admiring American style thrillers, the protagonists of this kind of drama, their world and its values, justice and the execution of justice, judgment, morality or amorality? The heroes and victims of this kind of world and the film's sympathy for them? The nature of actions and their consequences, the role of conscience, the justification of such actions, especially concerning death? who was the main focus of the film, Ripley or Zimmerman? The title and the American reference to Ripley, the friend and the focus on Zimmerman? The film's focussing on both: two facets of a man? The interconnectedness of their lives, personality, relationships, friendship, life and death? 6. The character of Ripley? Dennis Hopper's personality, appearance, nervousness? The introduction to him and his work with the American artist, deals? The international traveller, at home in Hamburg, his house and his sense of being in his house? His attitude towards art and his presence at the auction, listening to people speaking and using people? His house and his taping his existential inquiry about himself, knowing less and less? Contemporary anxiety and fear? His understanding of Zimmerman's illness and his use of it? His visiting Zimmerman, the job with the frame and the painting? The gift and his return of the gift and Zimmerman's apology to	him? Why did he like Zimmerman, why did the bonds of friendship grow between them? His visiting him again and the gift? His care for him, especially after putting him in for the assassination jobs? 7. How did Ripley use Zimmerman? How did he regret it? The irony of his knowing that Zimmerman was employed as the assassin, his estimation of Zimmerman and making a mistake that he would do the job on the train? The importance of chatting with him and trying to persuade him not to go? His presence on the train and helping him with the killings? The bond of friendship which did not need to be explained? Their throwing the bodies off the train, laughing together? What had resulted between the two? Their going to Ripley's house and waiting for the intruders, their dealing with the intruders and killing them? The drive to the sea and the irony that Zimmerman would leave Ripley and laugh? Ripley still chasing him? Ripley's yearning for friendship? What would Ripley's future be? The presentation of the artist in America and an indication that Ripley would go back to his deals? what insight into the international drifter and the amoral mentality? 8. The interweaving of the introduction of Zimmerman with that of Ripley, Zimmerman as an expert in his work, a craftsman, perfectionist? His work with frames and our seeing hi hold them and use his eye and his hands? His shop? His presence at the auction and his advice? His love for his wife and her work at the auction? His love for his children? The various details of home life, especially the toys and the gadgets and his inventiveness? The importance of Ripley getting the information about his illness from the dealer as well as the audience hearing this? Sympathy for him in his illness, a sympathetic character? The irony of the telegram and the effect on his life? The interviews with the doctor and this tests and his anxiety ? especially chasing the doctor under the tunnel? The irony of Ripley and his visit and the seeming lack of connection between the telegram and the assassination assignment? 9. Zimmerman's worry about the rumours about his health, the arrival of Minot? The proposition, his initial reaction yet his toying with it and his final decision? The build-up to his leaving for Paris, the health reasons, the farewelling of wife and children? His being a victim of fake reports? His presence in the apartment, his assistant for the assassination? The building up of tension in the station and the long pursuit of the victim from train to train? The close-ups of the victim ? audience knowledge that he was a criminal and was being assassinated for so-called justice and yet the humanity of a man about to be killed? Zimmerman's shrewdness in following him? The killing and the irony of his being seen on the security television? His relief at achieving this and receiving the money? The alienation from his wife? Minot and the second request? Ripley judging that he would not accept? His going and his presence on the train? The tension on the train? Why did he agree to the assassinations? Was it just the money, care for his wife and children, their memory of him? The estrangement from his wife and her hopes to communicate with him? 10. What happened to him on the train, the background of the estrangement and the friendship with Ripley? His presence at Ripley's home and his wife's arrival? His decision to drive with her, the reckless driving and his death and her presence? What had he achieved in his life? 11. The portrait of Marianne Zimmerman - her work, relationship with her husband, care for him, estrangement, love for the children, her presence at the end, participation in his death? ride? The portrait of the children and their relationship with their father and the touch of tenderness? 12. The American artist and his hold over Ripley? The dealers in Hamburg and the experts, the buyers and their building up of money for the auction deals, rumours? The criminal aspect of the art-dealing world? 13. The point that Ripley made about making things and achieving and merely raking money? The clue to understanding the two characters? 14. The background of gangsters, seeing them in New York, the irony of Ripley going past their apartment? Their presence on the train? The killings, their waiting for Ripley, the ambulance and the brutality of their deaths, and being outwitted? The burning of the ambulance? The gangster background to the thriller? 15. How well built up was the tension in the auction sequence, the scenes at Zimmerman's home? Ripley's visits to the shop? The long Metro sequence? The Munich train? The guarding of the house and the intruders, the beach sequence and the reckless drive? 16. What did the film have to say about people, relationships, power, money, love, death? 17. The film's judgment on its characters, their conscience, their decisions?